Like many other books, I had first picked up this book at the Airport and was interested. I later got the ebook version of it, and read it on my iPad. The author, Teju Cole had returned to New York after a trip to Lagos and decided to record his trip on a blog. 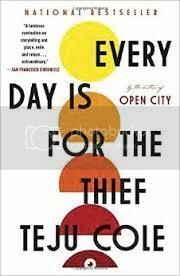 The result – a fictionalized mix of memoir and reportage, this book “ Everyday is for the Thief”. This book is direct and on the face. It delves in detail about the corruption and the sense of hopelessness that captures the Nigerian society. The book provides some powerful insights into Nigerian beliefs and social practices. There are many authentic glimpses of the prevalent bribery and rampant corruption across the city. The book details the situation at the Nigerian Consulate in New York where an additional payment is required for the VISA – an expediting fee that goes straight into the official’s pocket. As soon as your reach Nigeria, a Mufti clad official asks you very blatantly for Christmas gifts in Dollars. The simple mentality of “you have become wealthy, we should become wealthy too!” runs through the book. Teju Cole has a photographer’s eye for detail. From the authors account it feels like the Nigerians have no choice but to leave the country and establish themselves outside before their voices can be heard. In many ways, the African society seems to be so much similar to the Indian society. Is this the normal curve that a developing country needs to tread, or is there an actual historical connection that makes us so much similar? The book is beautifully written and is compelling and concise. A good quick read for someone interested to know how it is like to live in Lagos.